Since the first week of April, my life has been a whirlwind of events which has redefined my history , my present and perhaps my future. These events and teachings are summarized in this piece titled : The Quest for Wholeness that I recently submitted to the Huff Post Blog . Following is some additional thoughts that have come to mind since then. For me ,living in the present moment is an illusion. The teachings of my past, particularly as it relates to recent discoveries about my father’s side of the family have helped me understand my present choices more fully. It has also helped me to understand the paths that I embraced to get to where I am today. When we choose to learn from our past and let our history become a teacher to us in the present, a rich part of our life experience has been restored. Don’t leave any stone unturned in your own personal quest to redefine yourself after catastrophic loss or life altering transitions. The recent rich teachings from my ancestors have really reinforced this point for me. Truth exists before we become evident of its existence in our own lives. I am blessed to discover that I have living family on my father Austin Marion Roberts’ side .I look forward to creating new family memories with my cousin Jo Anne. Before I was simply content to be around my “soul family” or those individuals who have had a profound influence on redefining my perspective after my daughter Jeannine’s death in 2003. The universe’s plan is always better than ours. My father was only in my life for five years ,but I love him more now than I ever have. What he taught me can’t be measured by human law. 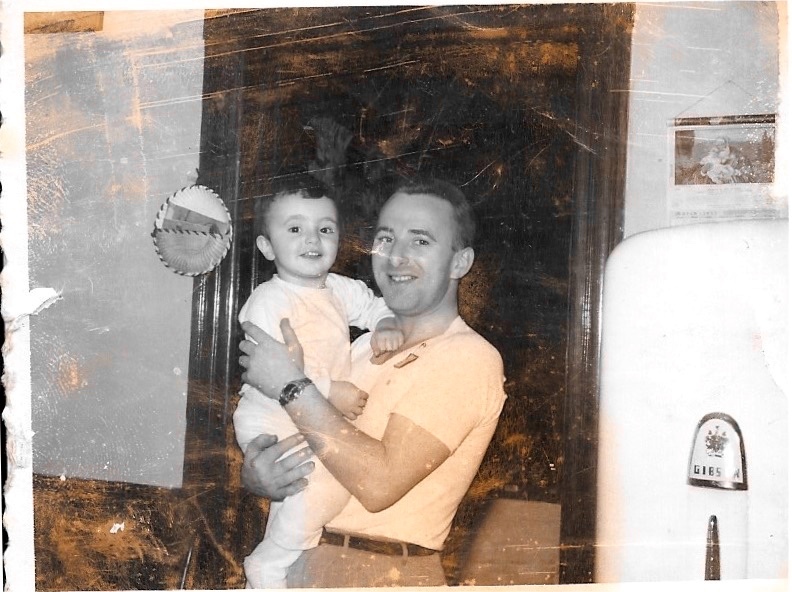 Me and my dad ,Austin Roberts circa 1955. I know that I was truly loved. I can not overlook the influence of “The Billy Factor,” in my recent life discoveries. The Afterlife of Billy Fingers by Annie Kagan was recommended to me by a friend who walks a very sacred path. As she is not one to make spontaneous book recommendations, my curiosity was automatically aroused. I discovered that the book was released on March 1,2013, the 10th angelversary of my daughter Jeannine’s death.Billy danced with addiction during his lifetime. After his death(or rebirth to a new existence) ,he ascended to the status of a highly evolved and wise spirit ,communicating divine truths to his sister on earth. The book validated all of what I believe about the afterlife, but in retrospect did much more. Understanding the context of Billy’s life path prepared me to embrace without judgment the life path that my father and his ancestors chose to walk. In fact ,I was able to fully embrace the gifts of their dysfunction and reclaim a part of my history that I thought was forever lost.